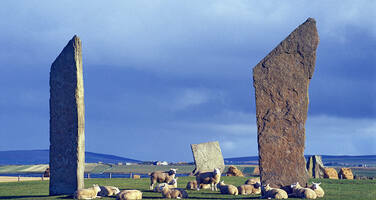 The monuments of Orkney, dating back to 3000-2000 BC, were inscribed as an outstanding testimony to the cultural achievements of the Neolithic peoples of northern Europe. Their culture flourished for around 500-1000 years at a particularly dynamic time in European pre-history. The monuments include Maes Howe, a chambered tomb, Stones of Stennes and Ring of Brogdar, stone circles and Skara Brae, domestic remains. The Monuments of Stones of Stennes and the Ring of Brogdar, are visually interconnected and in their relationship with the sea, an inland loch (lake) and surrounding hills, are seen to map human interconnection with earth, water and sky. The World Heritage Centre received information concerning a proposal to erect three large 72 metres wind turbines to the north-west of the Stones of Stennes and the Ring of Brogdar. These turbines would be highly visible on the horizon of the bowls of the hills surrounding the two stone circles. The proposal was approved by the local council in spite of a good management plan, clear polices to protect the components of the World Heritage property in local plans and advice from Council Officers to refuse the application. The proposals were then subject to a Public Inquiry at which Historic Scotland, the government agency for heritage in Scotland objected. The outcome of this inquiry is still awaited. In its report dated 30 January 2008, the State Party acknowledges that the proposed development would impact adversely on the integrity and outstanding universal value of the property and sets out the objections made by Historic Scotland. The report also informs the World Heritage Centre that the management plan is under review. This may be an opportunity for strengthening the protection of the visual integrity of the property. 4. Further requests the State Party to provide three printed and electronic copies of the draft revised management plan for review by the World Heritage Centre and the Advisory Bodies. 2. Expresses its concern at the potential impact of the proposed wind turbines on the integrity and outstanding universal value of the property; and requests the State Party to suspend the project;.